The Lower Elementary Cottage: Gingerbread Girl Day! Meeting Sensory Needs in Fun Ways! Gingerbread Girl Day! Meeting Sensory Needs in Fun Ways! 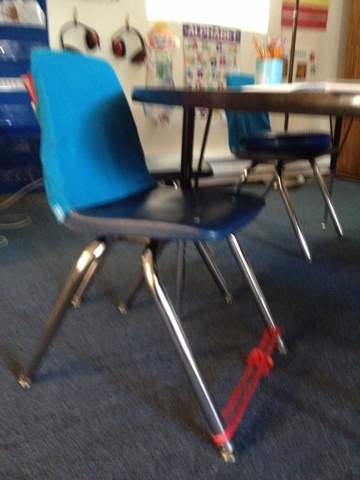 I tied a kid to a chair today... only in a SPED class can you get away with this and not be in trouble! I've dreamed of doing this many times... this was the first time it was actually justified (i.e. I won't get fired for it). LOL! See the story below. Today was Day 2 of my gingerbread unit! I'm loving it just as much as the kids! Today my kids chose The Gingerbread Girl because one boy had already heard the story and the other kids were excited to hear the twist and figure out how she doesn't get eaten. They were very giggly at the idea that she tricked the fox this time. Then we did a Venn Diagram AKA Double Bubble to compare The Gingerbread Boy and The Gingerbread Girl. I was happily surprised at how well my youngest ones understood the graphic organizer. One of my kindergarten boys was actually better than my second grader when it came to figuring out what to put in each section. The kids were really excited to help me fill out the chart. Lastly, the kids all drew themselves as a ginger-person. I gave mine blue hair :) We also drew our gingerbread houses and decided what creatures were chasing us. I was chased by a hungry zebra! There were also gorillas, and lions! Oh my! One of my little guys is starting to learn how to make better choices. I've been working on teaching him to meet his sensory needs in good ways instead of troublesome ways (touching/grabbing people, squealing,, etc.). One thing his OT sent to school was a resistance band. I put it on the legs of his chair, and he kicks it with his feet. This really seemed to help him stay in his chair, and he didn't touch his peers as much either. The next thing we've been working on is teaching him how to ask for tummy time. He gets to lay on his tummy with a clipboard on the floor to do his work instead of being stuck at the table. He surprised me by remembering to ask for the weighted blanket during today's tummy time. I laid it on his back and he was SOOO focused! This kid really struggles with sitting still, and he was completely motionless with the exception of his pencil writing! Later in the day he started to get wiggly again, but I could have him do tummy time when he was sharing materials with his classmates. So I tried something silly...but it worked and he enjoyed it, so that's all that matters!! I strapped him to his chair with Velcro! HAHAHA! I should explain...I reminded him how awesome he did when he used his weighted blanket earlier in the day, and ask if I could try something. He began to giggle when he knew I was up to something. 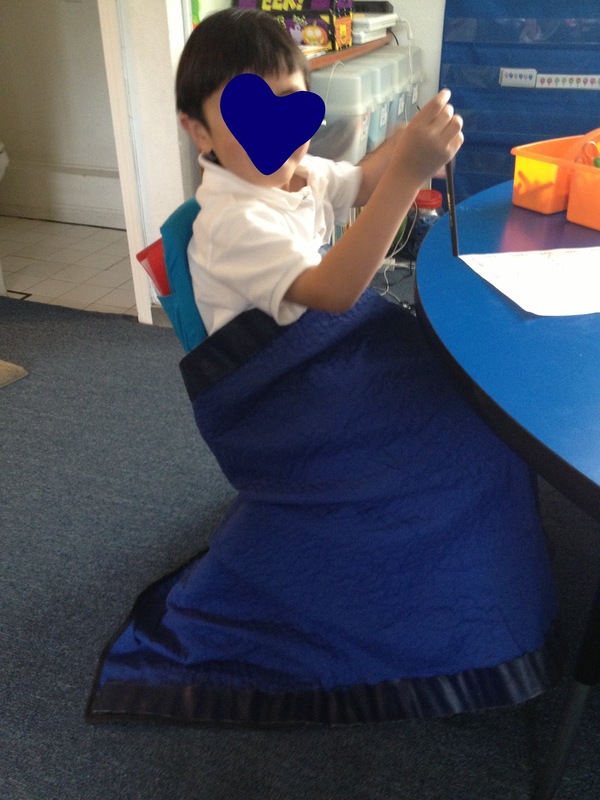 He agreed, so I put the blanket around him while he sat on his chair and connected the Velcro! I learned long ago the blanket is too big and heavy to keep from falling off a tiny lap. Don't ask me why my blanket has velcro... I inherited it that way. The results: The kid did awesome! He stayed on task (a small miracle! ), asked super-duper politely anytime he wanted something out of his reach since he couldn't get up, and it was far less distracted by his peers than he normally is. It is so great to read a post about meeting sensory needs in the classroom! I too have these OT strategies in my classroom, and use them everyday. My weighted blanket is my favorite (mine also has velcro!). Have you tried a weighted vest or huggie vest? My kids either love the pressure, or hate it. Might be something to check out. Too funny! Yes, I have a weighted vest too, but this little guy is by far my tiniest kid ever, and it's too big for him. I've seen the huggie one, but I don't have it.